Whispers in the Loggia: Sic Transit Gloria Chimneys – In Landmark Move, Blase Bolts "The White House"
Sic Transit Gloria Chimneys – In Landmark Move, Blase Bolts "The White House"
Once upon a time, not all that long ago, three iconic homes stood alone in American Catholicism to symbolize the power of the cardinals who lived in them, and far beyond, the prestige to which a striving church aspired: Boston's Italianate palazzo at the center of the Brighton Chancery compound, Philadelphia's antebellum jewel entered from Cardinal Avenue on the city's edge... and above all, the red-brick "House of 19 Chimneys" by Lincoln Park, from which over a century of Chicago archbishops would dominate the most centralized and complex ecclesial empire these shores have ever seen. And now, in just over a decade's span, they're all gone. In a shift of epic significance four weeks before he takes the reins of the nation's third-largest diocese, Archbishop-elect Blase Cupich announced late yesterday that he would make his home at the rectory of Holy Name Cathedral, declining the residence used by each of his predecessors since Chicago's first archbishop, Patrick Feehan, moved in on its completion in 1885. Unless you've been living under a rock, the decision should come as no surprise – within hours of last month's appointment, Team Cupich privately indicated to Whispers that Pope Francis' nominee (who's lived in a spare apartment at Spokane's college seminary since arriving there in 2010) had already decided against residing at 1555 N. State Parkway, but was still figuring out how to implement the plan... hence a certain headline. While the incoming archbishop's subsequent public comments would essentially convey as much, with the call now officially made, the move marks the end of the oldest and, beyond question, most legendary of the towering houses on deluxe plots which signaled the arrival of a poor, oft-persecuted immigrant church among the elite of the nation's major cities. 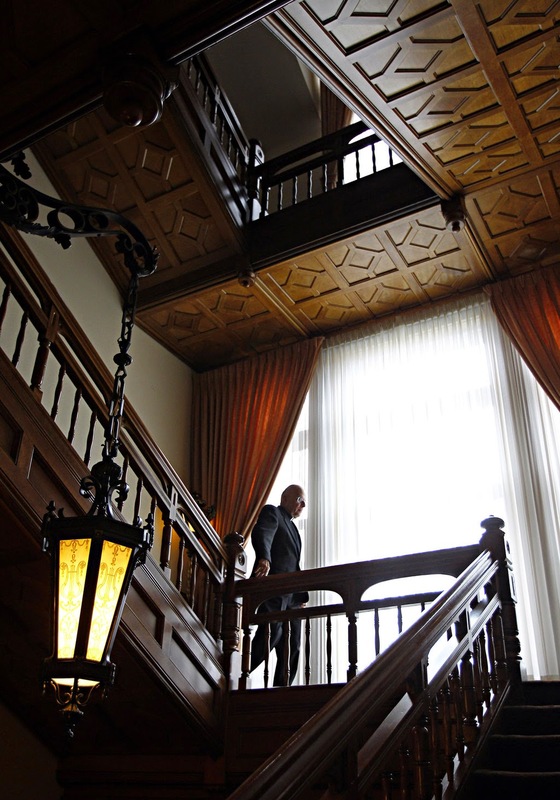 That said, even as a CNN report earlier this year estimated the property's worth at $14.3 million, given decades of lacking maintenance on the place, one prelate who's known the residence well through the years recently termed its current state "a dump." According to the archdiocese, the property's future use will be determined by a committee whose membership wasn't disclosed. "In the coming year," meanwhile, Cupich will continue to use the building's ample public spaces to host official functions and provide hospitality for out-of-town guests once he arrives and is installed on November 18th. 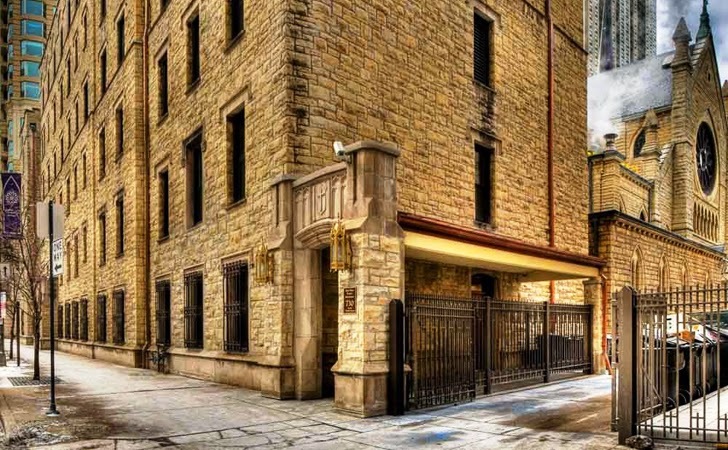 At Holy Name Rectory, the Ninth Archbishop will occupy the three-room flat last held by a local legend: Bishop Timothy Lyne, the cathedral's longtime rector and arguably Chicago's most beloved priest, who died last year shortly after celebrating his 70th anniversary of ordination. As part of its lure in the city's heart, meanwhile, the cathedral plant has the benefit of being a three-block walk from Quigley Center, the former high-school seminary recently converted into the archdiocesan headquarters. To the degree his schedule permits, the Chancery said Cupich would pitch in to celebrate daily Mass in the cathedral and, per local reports, the archbishop will take his meals in common with the other eight priests who share the house. 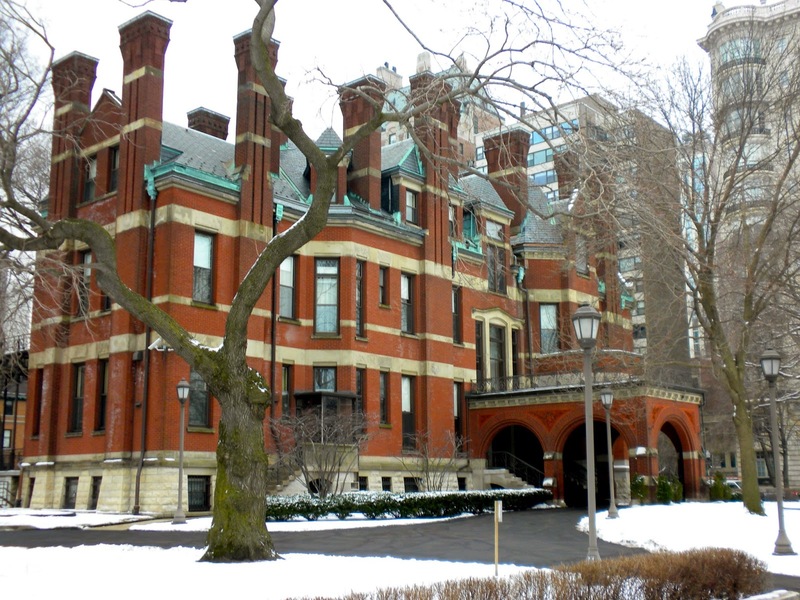 As reported here on the eve of the appointment, Cardinal Francis George had broached the idea of parting with the residence in the early 2000s, but was persuaded to nix the discussion amid protests from descendants of the immigrants whose "pennies of the poor" built the house for Feehan and his successors. Having engaged his own exit blitz in the city's papers, TV and the diocesan New World over recent days, while the 77 year-old cardinal has long planned to move into a suite reserved for him at the Cathedral's former convent, George – who recently compared the residence's role to that of "The White House" – is said to have been strongly encouraged to stay put at the parkside manor in light of his delicate health and ongoing cancer treatment. In any case, should his successor feel the need to stretch out, the post Cupich inherits finds its even grander home far from the city in the "Enchanted Forest," at the residence modeled upon Washington's Mount Vernon which George Mundelein built across the lake from the seminary bearing his name, where the first cardinal of the American West died 75 years ago this month. Back at the rectory, meanwhile, plans are in full gear for three packed days of welcome rites, beginning on the 17th with an evening Liturgy of the Word. While the Installation Eve service is traditionally a Vespers focused on the local priests and religious (who will be in attendance), in this instance the service will double as Cupich's civic reception by local secular dignitaries. Given the presence of non-Catholic officials seeking to pay their respects to the new holder of Chicagoland's second most-prominent post (after the city's mayor) – not to mention the thicket faced by Catholic politicos in a heavily Democratic city amid criticism from the church's conservative wing – the setup can be construed as a diplomatic solution to the dilemmas which Communion time would've presented at the following day's Installation Mass, for which some 150 bishops are expected. The day after he takes the chair, the archbishop is slated to preside at two additional services: a morning prayer with Chicago's women religious and brothers alongside local representatives of the new ecclesial movements, then an evening rite for the archdiocese's sizable contingent of lay ministers and the nearly 700 permanent deacons with their wives, who comprise the largest diocesan presence of the renewed order anywhere in the global church. While the preceding sets the scene surrounding the Corporation Sole at the midpoint of an unprecedented transition, it's a special treat to give the first look at what'll soon be placed over the new Boss' spot in Holy Name itself – the arms of the Ninth Archbishop of Chicago, featuring Cupich's small but deeply significant change to the shield he employed in his earlier incarnations as bishop of Rapid City and Spokane. The archepiscopal heraldic achievement, or archbishop’s coat of arms, is composed of a shield, that is the central and most important part of the design and tells to whom the design belongs, the external ornamentation, that tells the owner’s position or rank, and a motto, placed upon a scroll. By heraldic tradition the design is described (blazoned) as if being done by the bearer with the shield being worn on the arm. Thus, where it applies the terms “sinister” and “dexter” are reversed as the design is viewed from the front. For the bishop of a diocese who serves as leader of an ecclesiastical province, called a “Metropolitan Archbishop,” the left side of the shield is given over to the arms of his jurisdiction; the arms of his diocese. The arms of the diocese, the Archdiocese of Chicago, are composed of a golden (yellow) field on which is displayed a bird coming forth from a ball of flames, known as a phoenix, relating to ancient mythology where the bird arose anew from the ashes, is symbolic of the great City of Chicago that arose anew from the catastrophic fire of October 8, 1871. On the breast of the phoenix is the monogram of the Holy Name, the IHS, in gold (yellow) recalling that the Cathedral-church of the See City is dedicated to the Holy Name of Jesus. On each of the wingtips of the phoenix is a gold (yellow) fleur-de-lis, a form of lily often associated with French heritage, to honor the French missionaries, Joliet and Marquette, who brought The Faith to the region of Chicago. 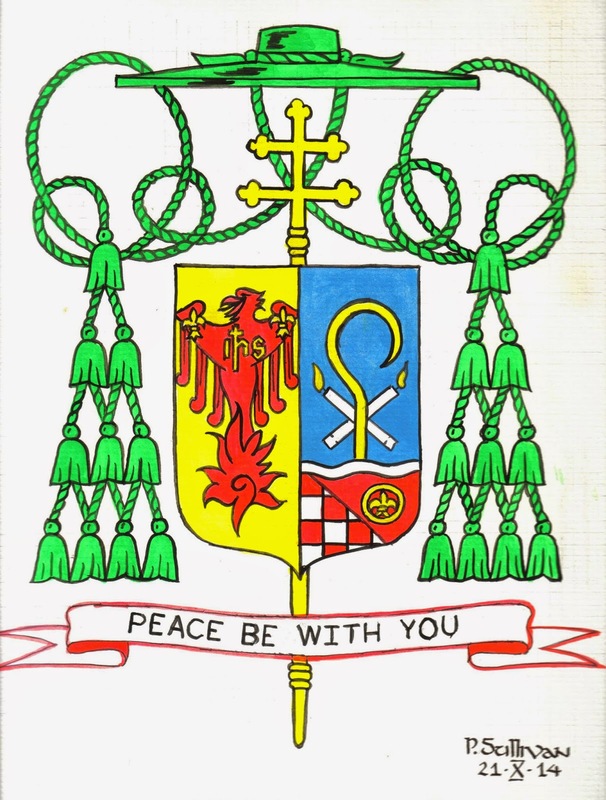 For his personal arms, seen in the dexter impalement of the design, Archbishop Cupich, has retained the arms, with some modifications, that were adopted upon his selection to receive the fullness of Christ’s most holy Priesthood, when he became bishop of the Diocese of Rapid City, in South Dakota. The upper portion of the design is divided from the lower portion by a silver (white) wavy barlet to represent the Missouri River that forms the eastern border of the Diocese of Rapid City, the local church where Archbishop Cupich first exercised his episcopal ministry. Below the river, on a red field, is a gold (yellow) annulet (open circle), a “sacred circle,“ to signify the Native American peoples, who the Archbishop has served in many ways, and in the middle of this circle is a gold (yellow) fleur-de-lis, taken from the arms of the Diocese of Spokane, where the Archbishop served when he received the call to serve God’s Church in the Metropolitan See of Chicago. In the left (dexter) portion of the base, angularly divided, is a field of red and white checks, that is part of the arms of Croatia, the land of the Archbishop’s family and it is displayed to represent his ethnic heritage. For his motto, His Excellency, Archbishop Cupich has retained the phrase from the 21st verse of the 20th chapter of Saint John’s Gospel, where Christ meets his disciples, after the Resurrection, and He says to the, “PEACE BE WITH YOU.” This is The Lord’s lasting greeting for it is His gift to us. The achievement is completed with the external ornaments that are a gold (yellow) archiepiscopal processional cross, (with two cross members), that extends above and below the shield, and a pontifical hat, called a galero, with its ten tassels, in four rows, on either side of the shield. These are the heraldic insignia of a prelate of the rank of archbishop by instruction of the Holy See. 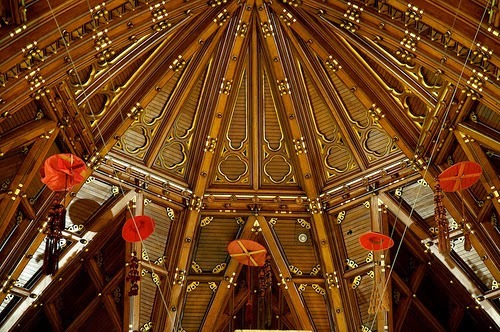 As the rafters of Cupich's home-to-be duly attest, the galero atop his arms would suddenly turn red should – following his last six predecessors – the incoming archbishop be elevated to the College of Cardinals: an ascent that, as with the last two Chicago archbishops, could quite possibly come in very short order. Accordingly, it bears reporting that, per house ops, Pope Francis is credibly expected to call a new crop into his "Senate" at some point in the first half of 2015, with next February (22nd, Chair of Peter) or June (29th, Peter and Paul) currently advanced as the most likely timeframes. Should the pontiff wait until midyear, at least 12 voting seats of the traditional 120 would be available to fill. Keeping with the practice of regular consultation as begun by B16, the next Consistory is likewise expected to coincide with Francis' intensely-awaited rollout of the reform of the Roman Curia, at least to a degree that the entire 200-member College is able to provide its input before the plan's execution. Lest anybody forgot, Francis didn't elevate a US prelate at his initial intake last February – the first time a Consistory included no new American cardinal since 1979. Then again, given the customary "rules" governing Stateside red hats, the nation's contingent of cardinal-electors has been at its usual full complement since 2012 and will remain so well into the New Year.